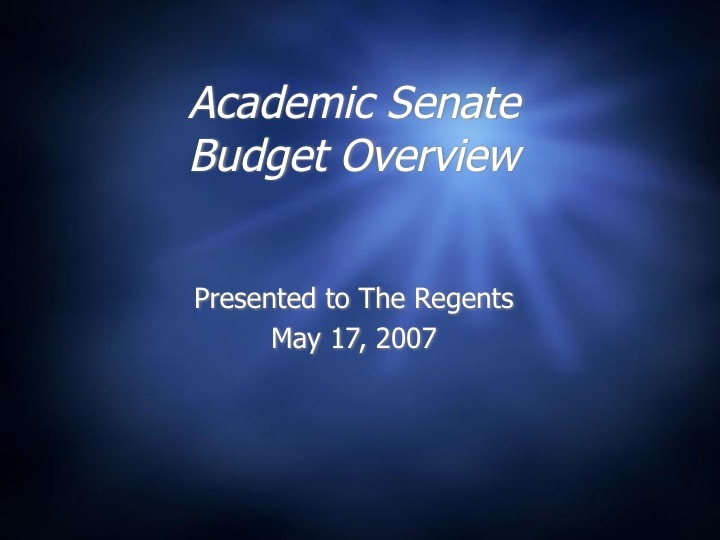 This week's UC Regents meeting is the tenth anniversary of a Senate First and, so far, a Senate last--a direct presentation to the UC Regents of a faculty view of the budget. 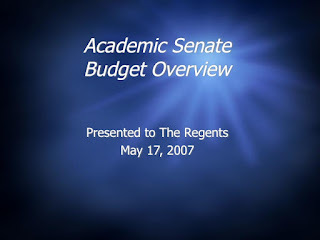 In May 2007, Senate chair John Oakley and UC Provost Rory Hume arranged for me as the chair of UCPB to present the budgetary conclusions of what came to be known as the Futures Report. It had, over a two year period, been researched and written by UCPB, approved by Academic Council, and submitted to President Bob Dynes for transmission to the board. John and I spent a fair amount of time with Rory boiling the report down to the simplest possible slide deck for our 15 minutes. We also picked the lowest-tech slide design we could find, to symbolize our humble professorial communion with the facts. 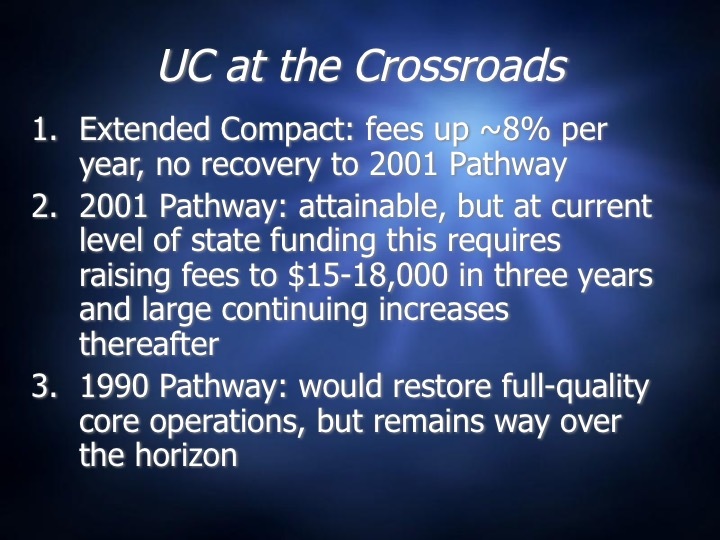 The whole project emerged from a period when it seemed that UC was capable of choosing its own path. It also seems that the faculty as a whole would play a meaningful part in that complex choice. I had hoped it would be the first of a series of regular faculty presentations to the regents, because I thought then and now that a real dialogue would ease the governance and budgetary problems that continue to haunt the University. Here's how it went. I enthused at the start that there's a reason we want to see a steady upward trend of state funding: that trend had enacted the idea of 8 or 10 research universities linked together in an integrated system, which meant that top-quality education would not just go to the top .1% or 1% but to 10% and more. 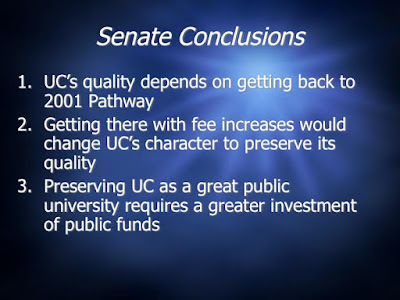 Strong public funding, I said, explained why UC wasn't SUNY or the UNC or Texas system with a couple of flagships and then a miscellany of varied campuses that conducted little or no research. Since public funding built the thing, why had funding been cut in two multi-year rounds (1992-1995 and then again 2002-05--we hadn't yet experienced the recent cuts that began the year after the presentation). Did the cuts just reflect a business cycle? 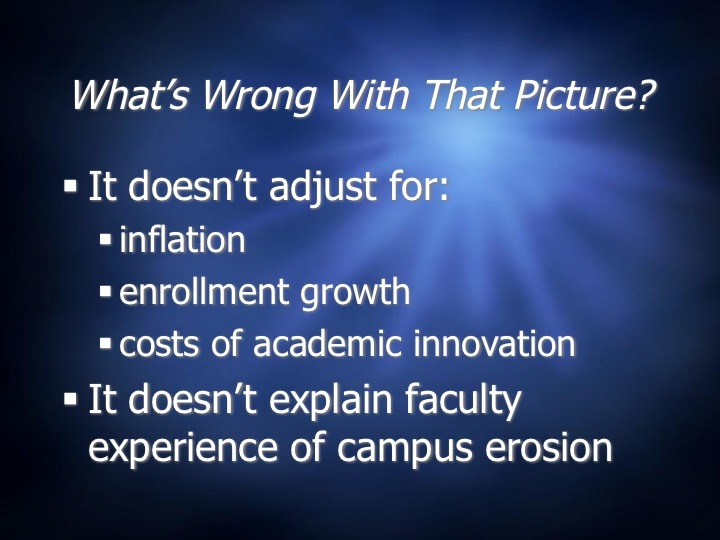 This is a slide that UCOP had presented to regents at least once a year. It said yes, it's up and down with a trend of state investment that is always up. But the slide was misleading. 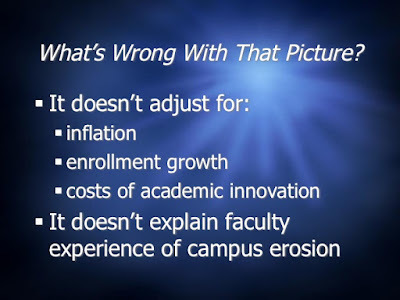 By erosion, we meant deterioration in core undergraduate instruction and services, deterioration in research climate and infrastructure, and, appealing to the board's perennial concern with status, loss of top applicants to graduate and undergraduate programs and of faculty. Grad program admissions had already become a prominent worry in the 2002-05 cut cycle. This is a measure of the state's overall financial resources available to support higher education: it's what people actually earn, in part because of their access to education. Between 1990 and 2005, this had been cut 35% in real dollars. 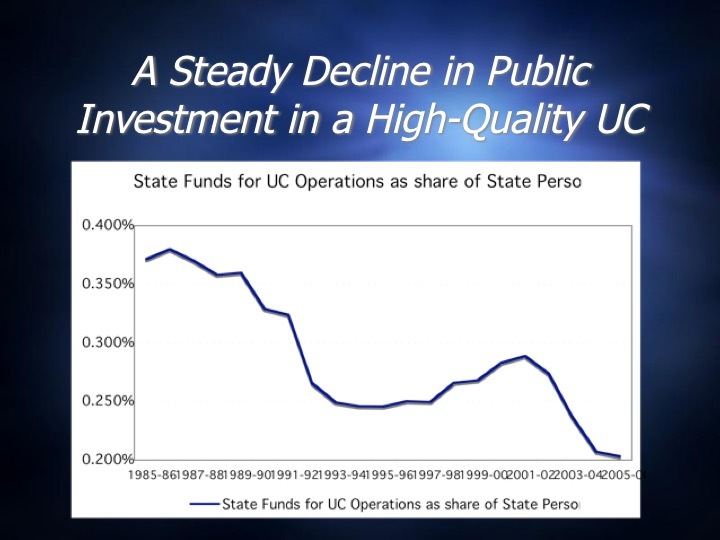 Sacramento had basically reduced UC's share of state income by half in the 20 years preceding the third round of cuts that would begin in 2009. This is common sense now, but a secular trend of disinvestment seemed to come as news to the regents and to most of UCOP ten years ago. We had tried for a while to get detailed budgetary data from UCOP, without success. So UCPB had decided to go ahead and do our own research with whatever was publicly available, and then ask UCOP officials to confirm or deny. 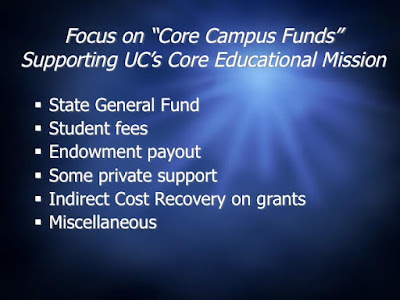 "Core" budget was a kind of breakthrough, because it carved out massive UC revenues that don't much to do with campus education. UCOP adopted this distinction in its budget for current operations during the Yudof period. 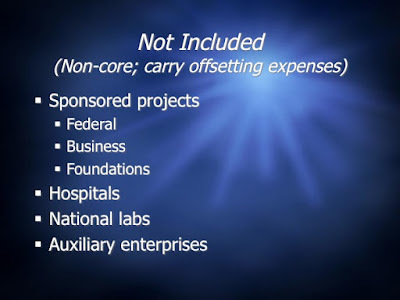 "Carry offsetting expenses" was a muted way of saying that many of these activities run direct net losses for the university, even if they have indirect gains for the university later (and direct gains for outside sponsors and society as a whole). To keep things simple, we didn't want to open that can of worms. We gave up an important opportunity, but I'd thought my Senate successors wouldcome back to the regents with followup material later on. 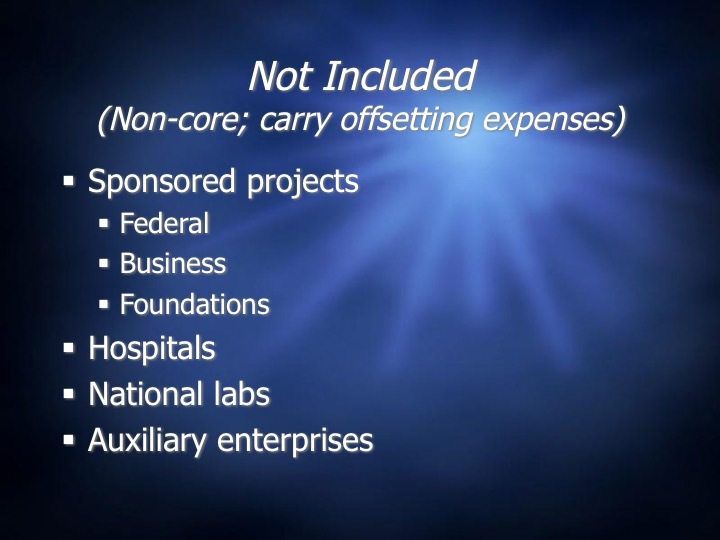 Our report was called "The Futures Report" because we projected costs for several different budget pathways. These three scenarios, plus a fourth called The Michigan Model (more on that in a minute), were compared to a benchmark that tracked the growth of state personal income. The idea was that UC's benchmark would be "growing with the state," neither more nor less, meaning we wouldn't be playing the "make up for cuts" game as we are still doing now. The established pattern was Lost Decade-- which has happened again. 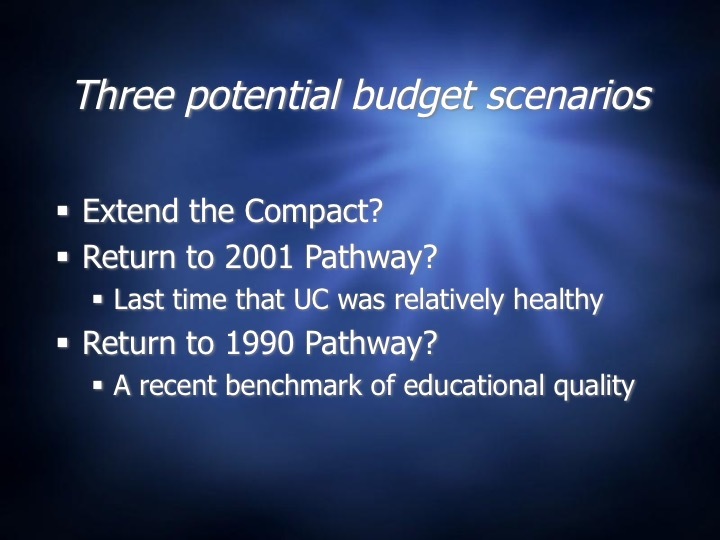 The Higher Education Compact with the Schwarzenegger administration was announced in May 2004. It accepted previous state funding cuts, promised state general fund increases of 3-4% per year, which it paired with tuition increases of 7-10% per year. It was a privatization prescription, because it shifted revenues from public to private sources. 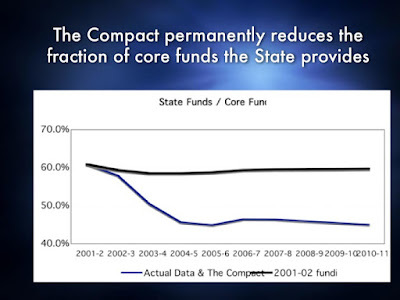 The 3-4% annual increases, coming on the base of much larger previous cuts, would never restore the state share of core funds. This made the regents visibly unhappy. I dwelt on these next slides, which are the densest in the deck. The failure of the vaunted Compact was a big deal. Items 2 and 3 will make more sense with the following chart. We decided this slide would be too complicated for the presentation so we left it out. The thin purple benchmark line represents UC "growing with the state" (UC's state funding rising at the same rate as state personal income). 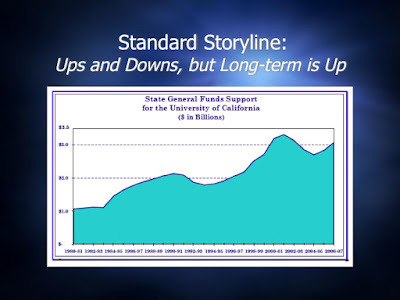 The black line represents a ramping up of state funding to rejoin the 2001 Pathway in the five years to follow the appearance of the report. 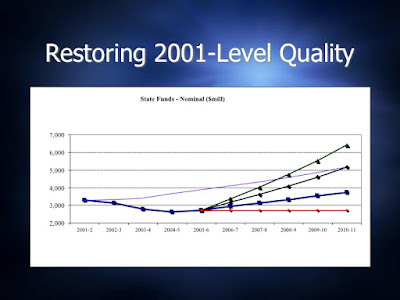 Number 3 (two slides back) refers to a restoration to 1990 levels of high state funding and low tuition (the green line in the preceding slide that ends up at over $6 billion per year in state funding). That is twice what UC gets today. But it is merely the same share that UC had in 1990. We thought it would be easier for the state to get its head around 2001 than around the full "master plan" funding model. On to the next question: what is to be done? "Research is costly" means research runs net losses, not profits. Private fundraising works on the margins for selected programs, but not to replace lost operating funds for public good activities like high quality instruction and its direct admin support that donors assume the state and students pay for. The only great private revenue stream for operations is student tuition, at very high levels. This caused more unhappiness in the meeting. The headline of the next slide makes me sad. Ten years later we're at the same crossroads. 1990 is still completely out of reach. 2001 is more remote than ever. And starting in 2009, Sacramento dumped UC onto the red line in the chart above--a funding freeze, averaged over big cuts followed by partial annual recoveries. We called this the Michigan Model, in which the state disinvests and then the university hikes resident tuition and admits many more non-resident students (reducing racial diversity, class diversity and, in Michigan's case, national ranking). In nominal dollars (uncorrected for inflation), UC's general fund in 2017-18 will be the same as it was in 2007-08, somewhat above $3 billion. The takeaways were obvious to us. The Senate was at the time solidly in favor of rebuilding public funding rather than raising tuition or increasing non-resident student tuition revenues. We were of course deeply worried that the state had gotten used to giving UC and CSU less and would be happy to let us raise tuition instead (and then campaign against us for that). But it didn't stop us from stressing the logical budget necessity of public funding. How did the regents respond in the 3 minutes allotted to discussion? They didn't disagree with this last slide, but expressed unhappiness with the the budget conclusions. Regent Marcus said, "we need solutions, not all this negativity." I replied, "we're offering analysis; policymaking is the regents' role." A couple of exchanges later and our time was up. The next topic was the national laboratories, students that were hunger-striking against nuclear weapons came in and chained themselves to tables, Regent Pattiz invited them to go have a nice lunch which further fanned the flames, the police arrived and hauled them out, and that was the end of the faculty view of the UC budget. Fast forward to this week in May 2017. 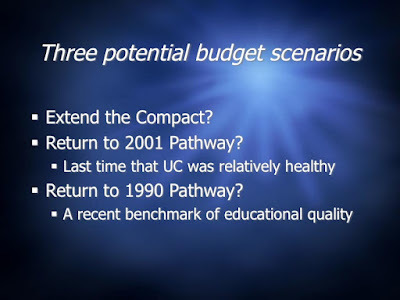 Many budgets have come and gone, and we've written dozens and dozens of budget posts, many comparing actual state funding to the personal income benchmark (with cheery titles like "Gov Gives UC Just About Nothing" and "The Old State Funding Model is Dead") and calling for faculty and UCOP to put out the strongest possible proposals to support full UC quality-- to budget the full costs of a Real UC and endlessly explain its educational necessity. What we are living through now is basically one half of the Compact that Arnold abrogated in 2008-09: we got the famous third round of double digit state cuts, followed by the 3-4 percent annual increases that don't really keep up with higher ed cost inflation, but not the annual tuition increases. Like the Senate, we opposed the Compact for increasing tuition at twice the rate of state funding. This was, to repeat, the deliberate privatization of core revenue streams. And yet the size of the combined revenue streams was in the ballpark of UC need, while our current Half-Compact has produced permanent austerity and structural deficits. 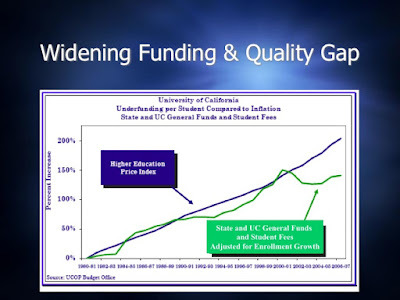 Today, UC's combined tuition and state funding revenues are below their 2007-08 levels. Net tuition has in my calculations gone from about $1.57 billion to $3 billion (p 224) in ten years, for an increase in tuition income of $1.45 billion when adjusted for ten-year inflation (20 percent). Then there's state funding. When we adjust it for inflation and for new capital and bond servicing costs now deducted from the state funds) at around 13 percent of the total general fund allocation, we find that per student state funding wasn't even flat for ten years: it declined by one third, meaning that about $1 billion less in adjusted dollars was available for operations. If we correct for the decade's enrollment growth of nearly 20 percent, per student general funding is one fifth less than that minus 1/3rd, which effectively wipes out all of the net tuition gains. Tuition increases have not made up for any of the real dollar declines in state funding, even after six years of supposed recovery. Remember too that this is before we throw in the pension wild card. At the current level of a 15 percent employer share of a payroll that is 47% of $31.5 billion in total UC expenditures (p 39), this is $2.2 billion annual cost for UC overall that it did not pay in 2007-08. 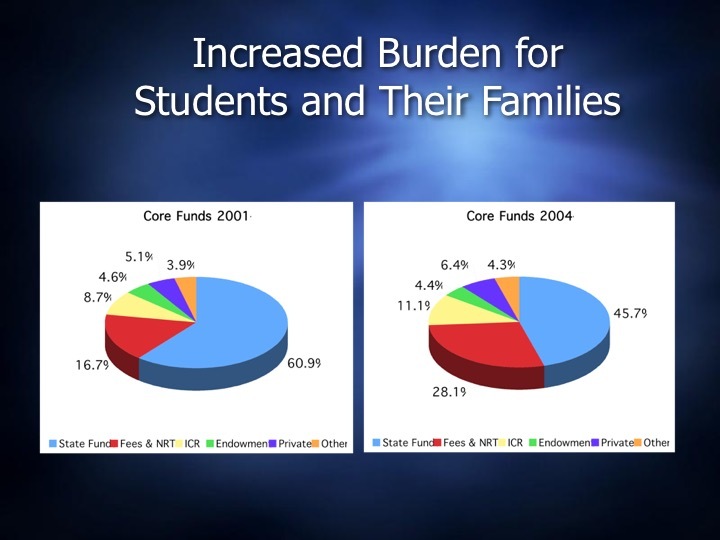 Even if most of the employer cost of the pension is incurred and funded by non-state payroll (medical center and national laboratory staff, etc), and the state share is one-third of the total, the campuses need to find over $700 million a year from core funds that are mostly state general fund and student tuition. Having gone back and forth with one UC budget insider about the share of state funding that covers the annual UC employer contribution, I think it's reasonable to conclude that the General Fund allocation for this expense has gone from $0 in 2007-08 to $200-300 million in 2017-18. In short, we've just lived through another Lost Decade of funding, and through a large net operating funding reduction. 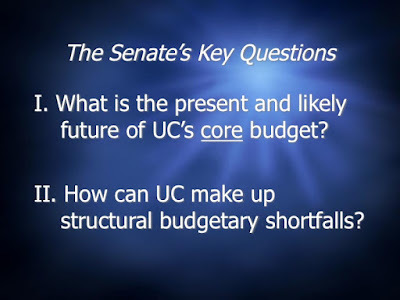 UC is unfortunately a textbook case of the decline cycle I analyze in The Great Mistake, which is created by divergence from public-good funding philosophies. You might be interested in our new report, The $48 Fix, which shows that the 2001 Pathway is still in easy financial reach--but strictly on a public good basis.